On the left, the first building is Thriftway Drug is on the corner, which is now a parking lot. I particularly like the old International pickup parked on the side of the street. Idaho Bank & Trust is on the far left intersection corner, which is now where the Keystone Realty Group and Fletcher Law Offices building is located. It is interesting to contrast this photo with this earlier picture of Idaho Bank & Trust because this photo now has the massive marquee hanging from the corner. You can see the support above, which I expect this sign did not last many years if it needed such a support system. On the immediate right corner, you can see Sprague’s Sport Shop. This is the location of the current US Bank. 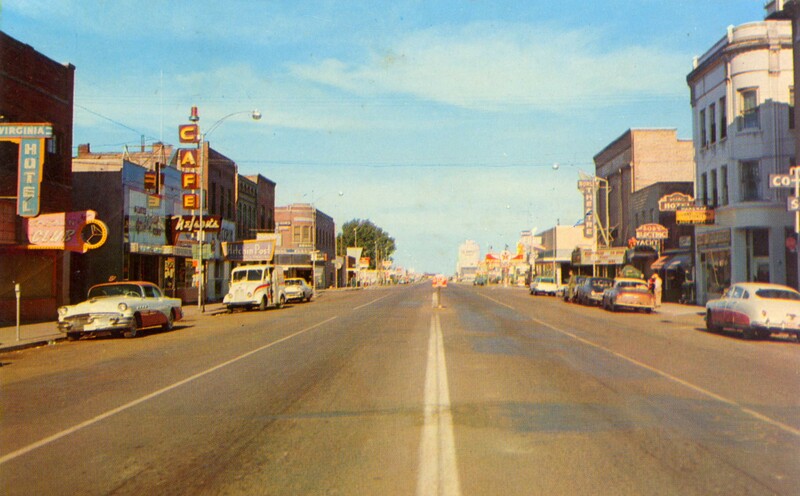 On the far right corner, the Burley National Bank building is still present. This is where Zions Bank is located now. You can also see the Burley Theater down the block with their marquee. I cannot recognize the tall building beyond the theater, I don’t know what that building is. You can also see the Simplot Factory Building that used to be much farther down Main Street. This is when there were more individuals living downtown with the apartments and restaurants emblematic of a more vibrant downtown. The number of hotels within these few blocks is staggering. 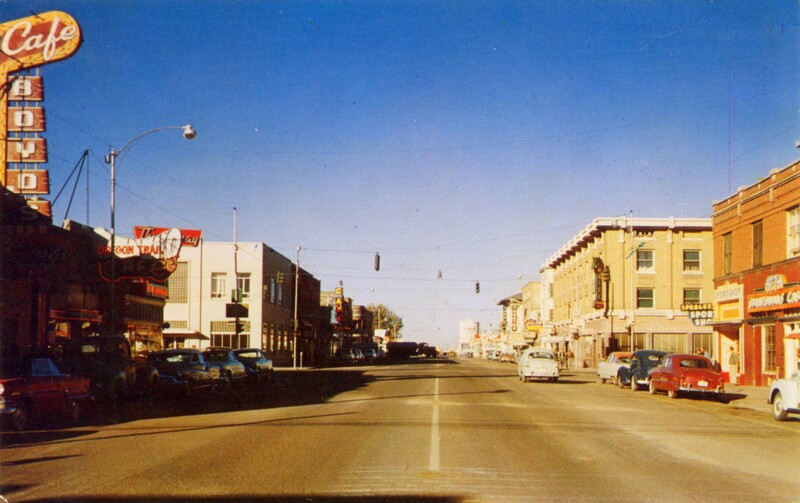 Main Street was the main highway (US 30) through southern Idaho which means this was a thoroughfare. The construction of the Interstate pulled all traffic traveling through several miles to the north. None of these restaurants moved north, it was just Connors moving from downtown Paul that moved to be near the Interstate exit. Here are another one of the postcards I stumbled upon and purchased several months ago. This is about a block west from the earlier postcard I posted several weeks ago. Another fascinating picture likely from the late 1950’s. None of the cars are from the 1960’s. All the more interesting are the buildings in the photo. Nelson’s on the left appears to have a new sign and a shiny front of their building reflecting the morning sky. There even appears a small marquee on the front of Nelson’s. Who is Nelson? You can see the sign for the Hitchin’ Post just beyond Nelson’s. This whole strip had its infamous tenor that I still hear about even now. I am surprised how many street signs there on the left side of Main street as far as the eye can see. In addition, the little stop sign in the middle of the street. On the right, you can see the Hardware store sign with the Hotel for the floors above it. Then Bob’s Electric and the Yacht Club. The classic, yet present, Burley Theatre. Then you can see the Ford sign for the Haight Motor Company. What little I could find the business was owned by Ludwig and Charles Haight, and after Charles Haight died Trafford Bray became a partner until it was bought out in 1975 by Jack Young of Young Ford. In my earlier post I did not recognize the tall building in the distance on the right. In this photo, it says J.R. Simplot on it, which tells me it is part of the Simplot buildings along that side of the street. I believe that tall part was gone by the time I have memories of west Main in Burley. Other than the Virginia Hotel on the far left and Simplot in the distance, all these buildings still remain. Another glimpse into the past of Burley, Idaho. 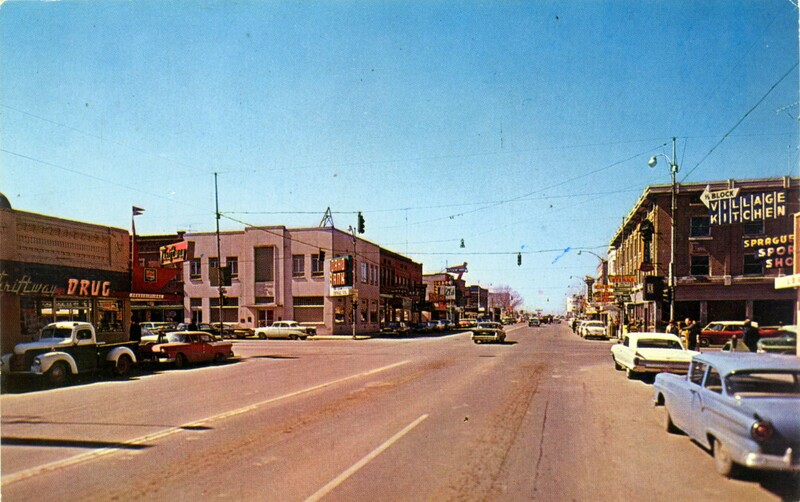 On Main Street at Overland Avenue in Burley, Idaho late 1950’s. I stumbled upon this photo on a postcard. Fascinating picture likely from the late 1950’s. None of the cars are from the 1960’s. All the more interesting are the buildings in the photo. On the left, the first is Boyd’s Cafe, then the Oregon Trail Cafe. About where Shon Hing is now. Thriftway Drug is on the corner, which is now a parking lot. Idaho Bank & Trust is on the far left intersection corner, which is now where the Keystone Realty Group and Fletcher Law Offices building is located. You can see the old sign for Nelson’s Cafe which is still there. On the right corner, you can see Sprague’s Sport Shop with the Sportsman’s Cafe to their right. This is the location of the current US Bank. On the far right corner, the Burley National Bank building is still present. This is where Zions Bank is located now. You can also see the Burley Theater down the block with their marquee. I cannot recognize the tall building beyond the theater, I don’t know what that building is. You can also see the Simplot Factory Building that used to be much farther down Main Street and the Texaco between the two, about where B&K Auto is now. This is when there were more individuals living downtown with the apartments and restaurants emblematic of a more vibrant downtown. Main Street was also the main highway through southern Idaho which means this was a thoroughfare. The construction of the Interstate pulled all traffic just traveling through several miles to the north. None of these restaurants moved north, it was just Connors moving from downtown Paul that moved to be near the Interstate exit.